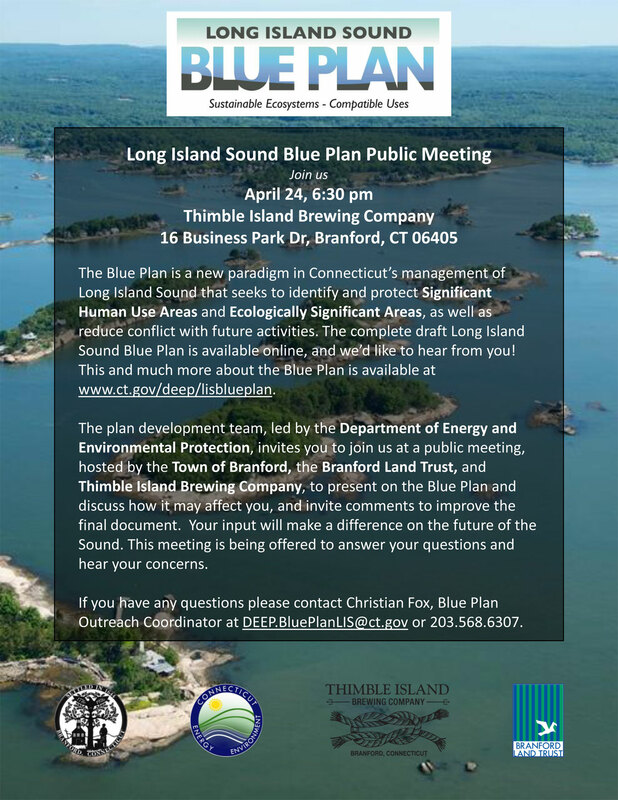 The Branford Land Trust is co-hosting a public meeting on April 24 on the Long Island Sound Blue Plan. The Blue Plan is a new paradigm in Connecticut’s management of Long Island Sound that seeks to identify and protect Significant Human Use Areas and Ecologically Significant Areas, as well as reduce conflict in the siting of new structures and activities. The complete draft Long Island Sound Blue Plan is available online, and we’d like to hear from you! 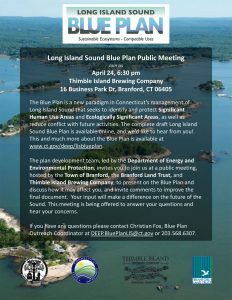 The plan development team, led by the Department of Energy and Environmental Protection, and in association with Thimble Island Brewing, the Branford Land Trust, and the Town of Branford, will hold a public meeting at Thimble Island Brewing to present on the Blue Plan and invite comments to improve the final document. We would like to invite you to join the discussion at this event; by participating in this process you are helping shape the future of the Sound. Your input will make a difference in how the Sound is preserved for our access. If you have any questions about this event, please download the flyer or contact Christian Fox, Blue Plan Outreach Coordinator at DEEP.BluePlanLIS@ct.gov or 203.568.6307. More information about the Blue Plan is available at www.ct.gov/deep/lisblueplan.